Every year I go on a long-weekend style ski trip with two pals. We are much more enthusiastic about our skiing than our skill-levels would suggest, but we are triers and we have (relatively) safe fun on the slopes. We all have our different roles. There is a fearless leader who likes nothing more than to plan a full day’s skiing; actually there is something he likes more than that, re-planning the day’s skiing. There is the one who keeps us all laughing and entertained. And then there is me. I do the gadgets, perhaps a little obsessively, so much so that I look not unlike an ungainly Borg as I career down the slopes with various cameras, packs, and dongles strapped to my person. iPhone5 with GoPro app and RunKeeper app. I brought the camera last year but its was always a bit of hassle to use because, other than audible feedback, there was no way of reliably knowing whether the camera was on or off, whether it was taking stills or videos, and if it was recording then where was it pointing? The new GoPro Wifi kit is a great solution. It consists of two main components. First there is the Wifi Backpac which, as usual for GoPro attaches to the back of the camera. It broadcasts a local wifi network for a remote control component (or mobile phone app) to connect to. The remote straps to your wrist and provides a duplicate interface for the camera controls. So at a glance its easy to see whether we are shooting or not. It works well. The mobile GoPro app (iOS) also works with the wifi backpac and has the added advantage that it streams video in near realtime to your phone. It’s a nice feature but a bit gimmicky, at least for our needs, and to be honest in the end the iOS app didnt get much use as it was inconvenient to fish for my phone to control the camera as I negotiated lifts and pistes. The wrist control was the way to go. The found the batteries on all 3 devices (camera, wifi backpac, and wrist control) lasted for almost exactly the same duration, a good 4 hours or so of usage, which was fine. For me the big revelation on this trip was my RunKeeper app. In previous years we have tracked our progress on dedicated GPS devices, which barely last the day on a single charge, and offer dubious reliability and accuracy. 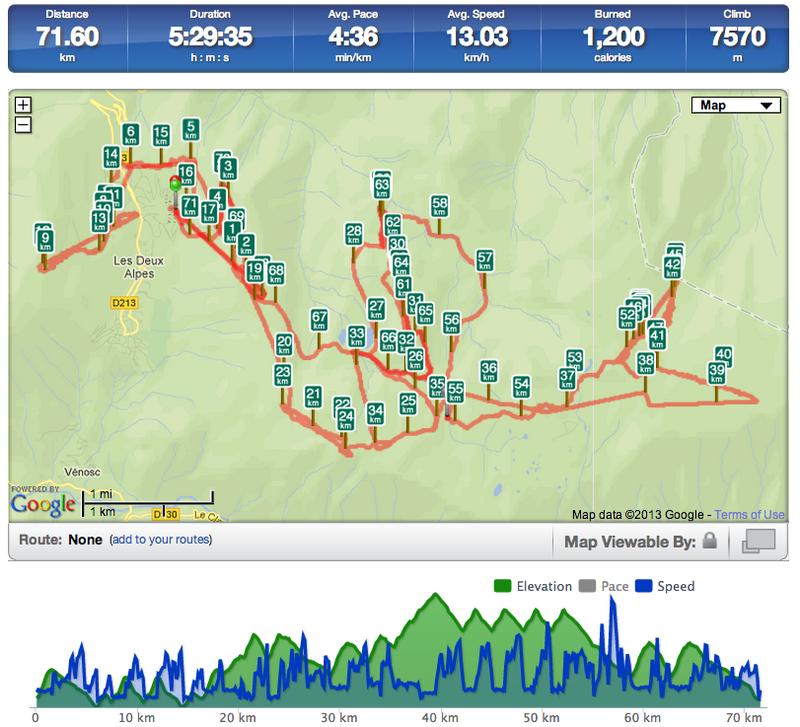 I’ve been using RunKeeper on iPhone for jogging for a while now so we tried it for skiing, without expecting too much. However it was superb: great location accuracy (verified when we overlayed our routes on the piste maps) and very good speed and altitude tracking. And best of all it didnt seem to kill my iPhone battery. Happy days! So all in all a great test-run for the big family ski holiday in February, where we three mates bring the kids and significant others off for a week of more leisurely skiing.